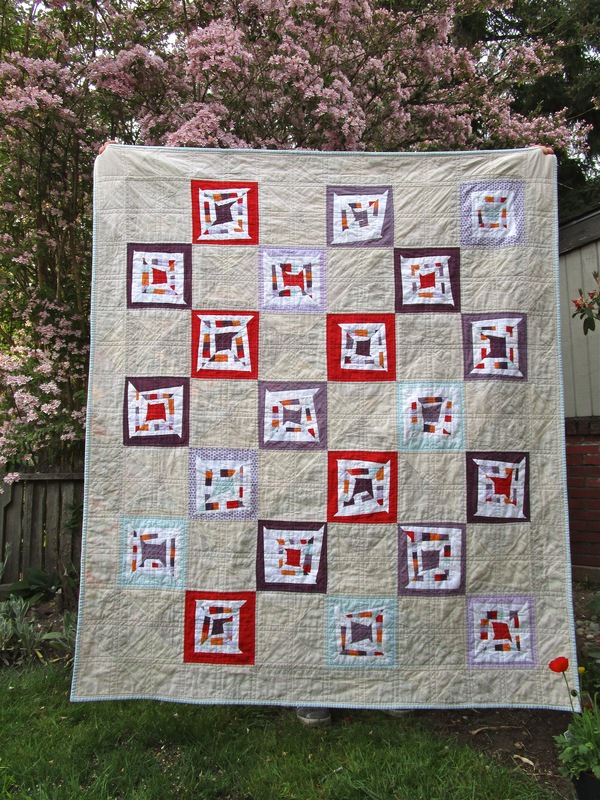 I completed this lovely ages ago and have just needed a brighter Seattle day to photograph it. I thought it time to share it with you. The Land of Nod spring catalog supplied an inspirational color way and it just so happens I didn’t have to buy any fabric to create it. Truly unbelievable. There are a mix of Konas, Cotton Couture, some of my go-to shot cotton orange, and a flannel. The whites are quite a cocktail including some flannel. Amazing how different whites can be. One thing about teaching workshops is you always need blocks in all stages to demo a technique. Before I know it I have enough blocks to finish them up into a baby/lap quilt which is a more manageable size to travel with, and yes, I do pack one King for lectures. I’d go mad if I have to remake the same quilt, so my inspiration was another variation of what I call the Psychedelic Baby Block for my improvisational strip piecing workshop. Teaching a technique over a pattern has its benefits for the short attention spanned like me. It gives me the flexibility to design something new. At 15″ square, using the technique I teach, these blocks come together fast. Straight lined and Grid Grid Grid went the quilting. I started with light blue thread, but ripped it out after a few lines and replaced it with white. I have to say I was not liking the line quilting design at all, but kept adding and adding until it came together. 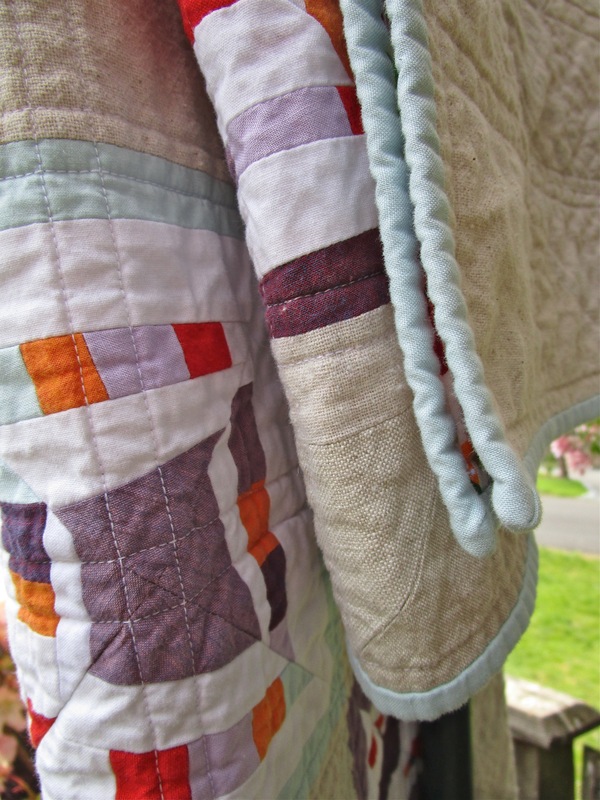 Enough quilting to please the eye and little enough to still have a soft drape. It has a great texture. I really wanted to purchase some flannel that I’d fallen’ in love with, but I poked around my stash and as usual was glad I did. These older Heather Ross prints and flannel came together into a lovely minimal back. My leftovers from the top were grey or white. White as a binding sounds like it would become a Swifter, so I went with the grey and it frames it nicely. I love the controlled chaos happening in it. I’m going to make a larger one for our bed once I finalize the color way. Decisions decisions. I am slow moving, but am working on a pattern for this quilt. P.S. 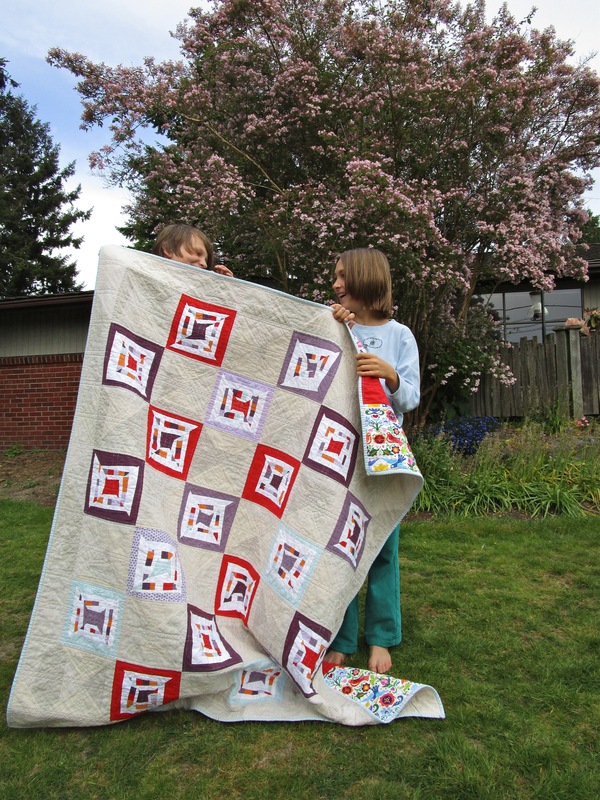 If you’re in the mood to hear about my quilts I’ll be doing a lecture tonight at the Seattle MQG and this Friday with the Frasier Valley Modern Quilt Guild (workshop sold out). I guess my call to finish up those quilt tops was needed and the classes filled! I’ve added two new sessions (evening and next Wednesday) to the straight line quilting workshop if anyone wants to come learn the tips and tricks that work for me. We’ll be making our practice pieces into useful nesting baskets. I’m still rolling with concept inspiration from my psychedelic baby block workshop and ended up with these fabulous pillows made with a block I’m calling Alignment Optional. Back in September I thought I’d revisit a color way we used in Quilting Modern for the Shattered Quilt, replacing the Carolina Chambray with yarn dyed Essex as my light and Michael Miller Cotton Couture for the black. I made some blocks, and well…they just didn’t look good. I packed them into a zip-lock and added them to the bureau in the basement where I collect marinating ideas. This approach is making the drawers a bit harder to open, but we all know the importance of play when it comes to creativity, which sometimes just means yielding your rotary cutter and making the cut. So that’s exactly what I did. Though it was fun to try two different straight-line quilting styles, when it comes to a pair so similar in design I’d like the quilting to be identical. Problem is I’m not sure which design I like best. All finished off with my invisible zipper tutorial and this awesome Alexander Henry Ghastlies Clover. I’m already envisioning my next pillows being fabulous in red and white for the season. Seattle’s got Halloween kind of weather going on. We’re currently enjoying the light things up and warmth that electricity provides, but I have definitely put some thought into a list of backup chores for if it goes. My fabric shelves and scrap bins are due a serious clear out and that alone could easily eat a few days. I’ve been joyfully moving stuff around all week. Decorations are up, and in their true place. Each year I love the hunt of a few well sought out additions, like these awesome lit pumpkins from Target for the top of my fridge. And just like Christmas I allow myself a few new Halloween prints. Novelty print generally means pillows. You already know I’m seriously not lacking in pillows and nothing stops me from making more. I believe I’ve added five to the rotation this year for Halloween alone;). Last year my splurge was this zombie fabric by Riley Blake. A huge spiderweb pillow (more here) has become Roan’s perch when waiting for his morning carpool. Playing with this block ignited some new ideas. Since it needed something matchie-matchie and I had left over test blocks I made a couple more. These pillows I made last year are still my favorites. 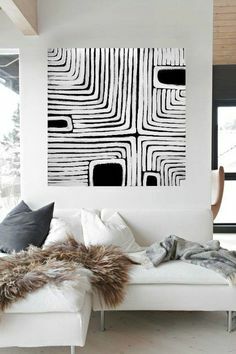 So in the Ghastlies print I made a couple long lumbars which are my favorite shape for comfortable couch lounging. I generally buy the forms from Garnet Hill, though IKEA does carry a nice rectangle shape. They’re down-filled and puff out to the corners nicely. You don’t need tons of forms. Under Halloween lives the Christmas ones, and quite possibly another layer under that. All have invisible zippers following my tutorial of course. My favorite made addition of the year is the hanging candy bucket I created using this paper pieced pattern. I’ve collected a few new patterns for next year. There are so many more projects I’d like to do, but I think I might be considered borderline something at this point. I’ve been collecting them all on a Pinboard. It’s probably time to think of a costume. Regardless of the pile of quilts in need of quilting, I’ve got a finished quilt top to show you! Another using what I call the Psychedelic Baby Quilt Block. It has just the right amount of improvisational technique mixed with a traditional on-point layout. I can’t seem to get enough of this string block, so after teaching this workshop for a bit now I’m trying to wrap my head around fabric amounts to make a quilt pattern. Where I get my color way inspiration for my quilts is a common question. Since I’ve had a languishing half-written post about the various avenues I take for gathering it, I’ll just share a bit here and there as quilts come together. 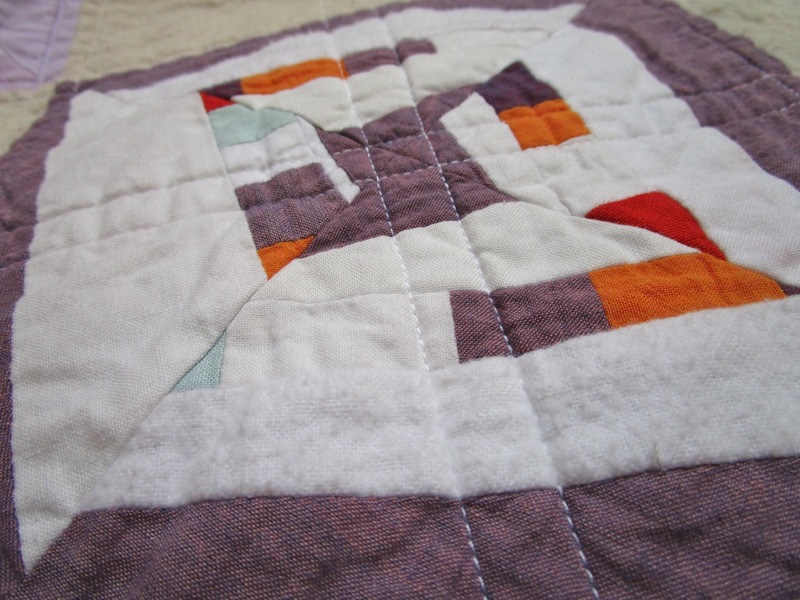 Like my last quilts of this nature, this color way was out of my comfort zone (step away from the purple Katie;). For this version I found inspiration in a Land of Nod catalog. 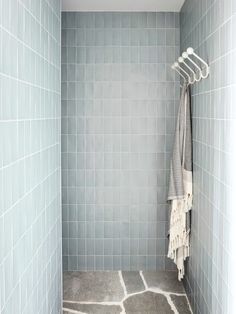 I often go this route because it gives me an opportunity to work with color combos that are trending or not on my radar. I’d recommend subscribing to catalogs that lean towards modern design (or traditional for that matter) and just like the endless bucket list of quilt ideas, you’ll never lack for a mixology of color. I generally rip out what catches my eye and pin it to either my quilt design wall or my Color Way Pinboard stocked with art, quilts and randomness, all inspiring. Once I’ve got a color way solidified I try to shop from my fabric stash as much as possible and fill in the holes from there. I try to think of it as a good challenge when I run out of fabric and mix something I have in (even a shade or tint lighter or darker). 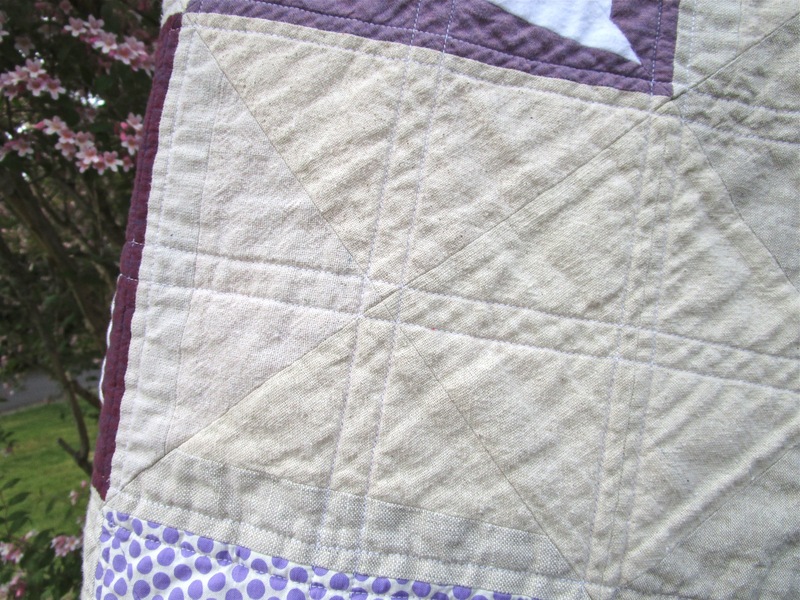 Though not as drastic as some, this quilt had that going on when it came to the white. I supplemented some white flannel and off-white adding some texture and depth. These blocks are BIG (15″ x 15″), and come together so quickly. The fun really is in seeing this block represented in each student’s fabrics and how excited they get about what’s happening on the design wall as the blocks are created. This month I’ve got out of town students coming to take the workshop while on vacation in Seattle. Because I needed new step-outs to teach, them coming provided me with the perfect excuse to play with another color way. This time around the colors actually work with something in my home. I tease I get my color out when it comes to making things. You’ll be seeing this block here soon with a little twist and a binary scheme. 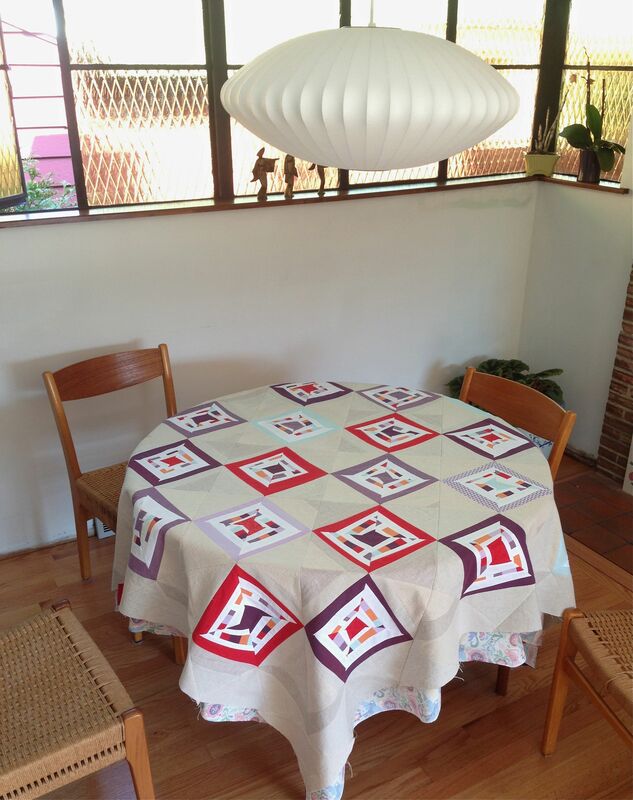 Because of the method in the workshop we actually can create two quilts (like my No/Know Quilts) at once. 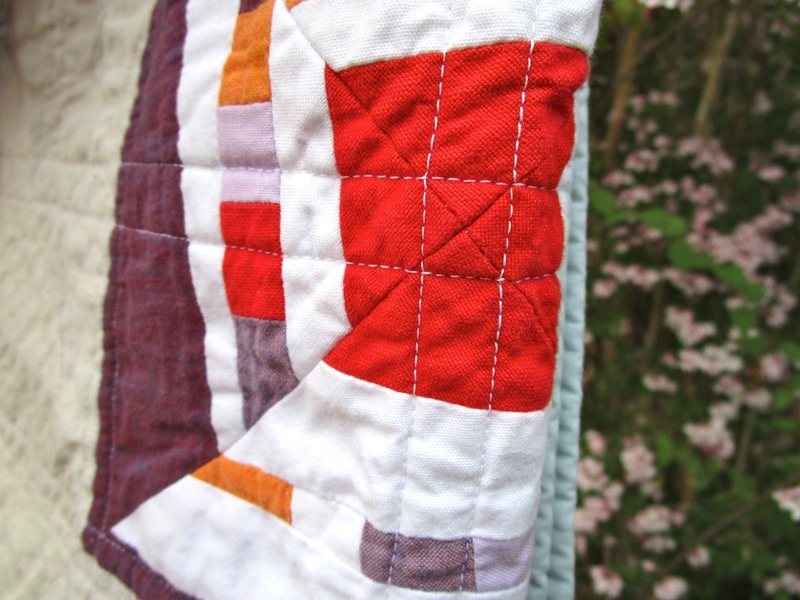 These blocks are great for teaching paneling and free-piecing. I hope to show you them soon as a finished quilt. You can see more of the Psychedelic Baby block in use here, here, here and here😉 and I’ve added one more Saturday workshop to the website. 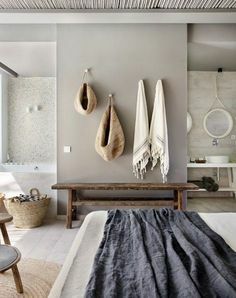 Since my trip to Georgia all the pillow forms in the house have been naked, just waiting for their clothes to be put back on. It seemed like a good opportunity to change them into something ‘new’ until I create the inspiration in my head to match my new rug. The triangle pillow I made in 2011. 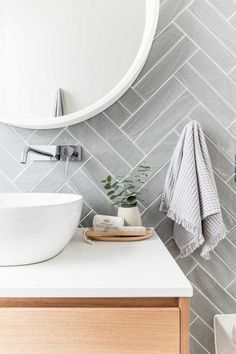 Grey goes with everything. When we were writing Quilting Modern I was always on the lookout for inspirational shapes not generally produced in quilting at the time. In a design magazine was a photo that had a pillow tucked oh so small in the background. I could barely make out what it looked like beyond the elongated triangles, but I stole what I could of the idea to make it my own. The log cabin pillow was born improvisationally on the design wall. I like how it pairs with the triangle one so I often showcase them together. I taped up the size of the pillow form’s perimeter (Euro size) and started filling it in, piecing the cabins together in columns mostly and connecting the columns with some gentle improvisational curves. The color way was 100% driven by this fabric I put on the back and of course I finished it with my invisible zipper tutorial. 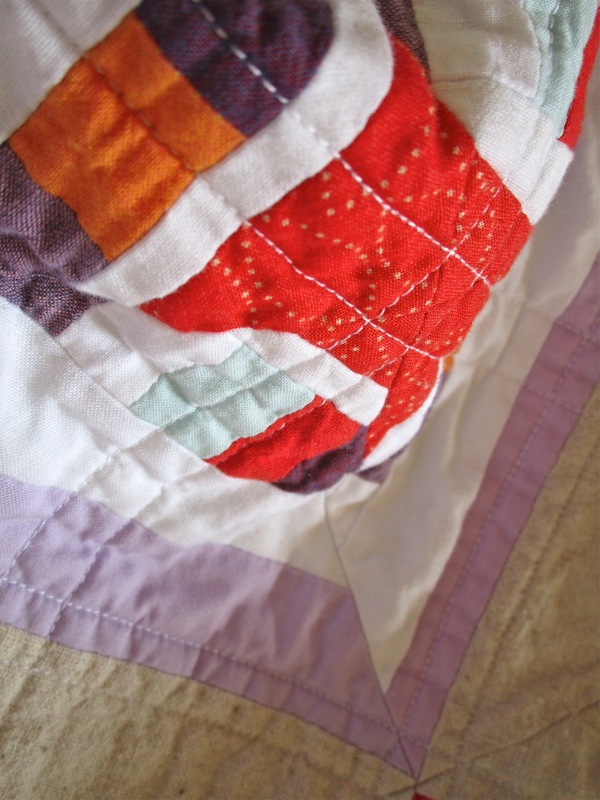 I’m normally driven mad by matchstick quilting, but it is perfect for pillows. Its density helps with giving the down pillow form some more structure. They never look this good after use, but fluff up nice. I went with a light aqua thread on both. I get all fired up about old unfinished projects when I see the techniques in use, so put this one briefly back up on the wall for a little work. It even matches the pillows. Hope all is well in your corner. Alexander Henry’s Merry Moderns fabric was THE Christmas quilt fabric for me. I just fell hard for it the minute I saw it. The fabric seemed a perfect merge for an improvisational technique I’d been brainstorming about. 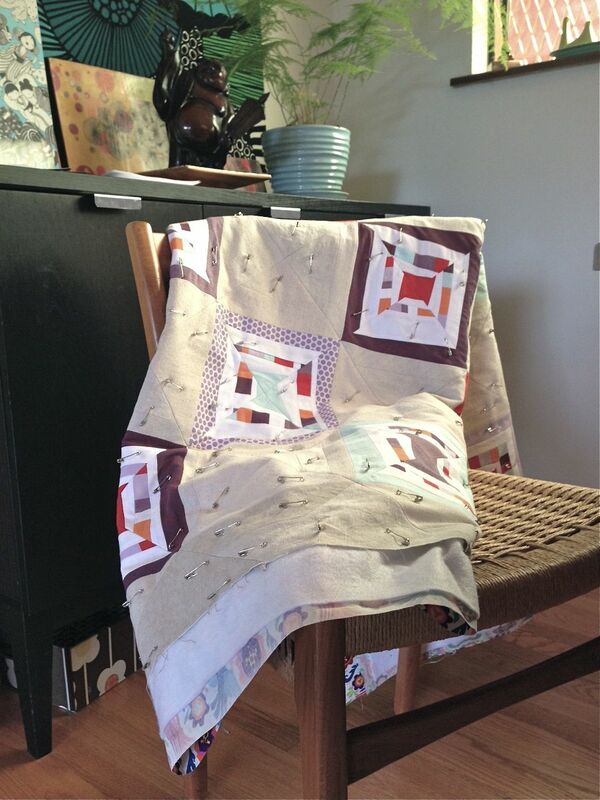 A block that was a faster way to produce ‘crazy pieced’ looking fabric. So I started playing with the block construction concept that became what I now call the Split Personality Quilt Block. The method quickly produces multiple blocks allowing you instant playtime with it in endless design concepts. Fabrics from the stash that would coordinate with a Christmas theme were pulled, auditioned and sewn. Some favorites were eaten up in the process. And so, all these happy fabrics have been living together as blocks for a few years, waiting for the perfect pattern to show itself. The essex linen in a cross weave black stabilized the scrappiness. Merging traditional quilt designs with improvisational techniques has really become where my process leads me. 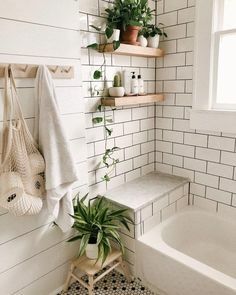 I love the secondary designs traditional set blocks create. 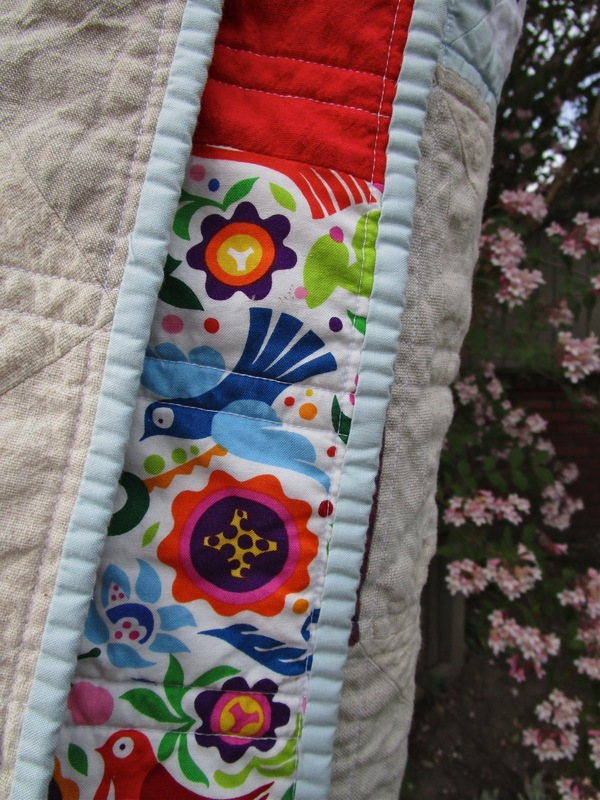 When it came to quilting I lived and breathed this quilt for days. For once I didn’t overthink it and went with straight lines that ran off the edge and echoed the ‘Xs’ the secondary design created. I dreaded the thought that I’d have to add another horizontal and vertical line because my body was done with quilting, but in the end I dismissed the addition. It has the perfect drape and isn’t over quilted into the luscious feel of cardboard. Here’s a peek at the back. Leftovers and flannel of course. The binding is the small scale print in the Merry Moderns line. It worked out that some faces landed on the front and back of the quilt’s edge. You can see more designs and concepts with this block in my Instagram feed and I’ve added this block onto my January calendar as a daytime, nighttime and weekend workshop. Valentine’s Day is just around the corner and then of course there is spring! I swear no quilt in history has been put up and taken down from the design wall more. I kept recycling the left over blocks that I call Psychedelic Baby Block into new design/layout ideas and now have an ample supply of samples for teaching the workshop. I was in high gear to finish it for submission to the MQG’s Texas Museum Exhibit, but I realized that with the minimal quilting it would start to sag if hung for long. Like how I’ve already envisioned it as accepted for exhibit? 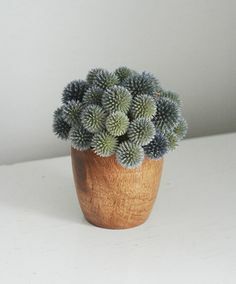 The softness is amazing. I don’t think I’ve even made a softer quilt. Not only did I mix in leftover blocks, but my neutral scrap bin got dug into. Though no dent was made in that bin, texture was added through a mix of linens, flannels, and Osnaburg fabrics. Shockingly even with the shot cotton it quilted up lovely. It was difficult to not throw in a print or two. It is one of the reasons I feel in love with quilting. Here’s a little peek of the dot I added too. Eleven year old boys are worthless at quilt holding for long, but good for showing scale. I did it again and used a fabric from stash for the back. Twice I ran out of thread when quilting and of course both times I was smack dab in the middle of that red strip where it would show the most. I left it. It’s a favorite Alexander Henry. The binding I actually cut for my On Target Quilt before I changed my mind to something darker. I held onto it thinking it would work here. 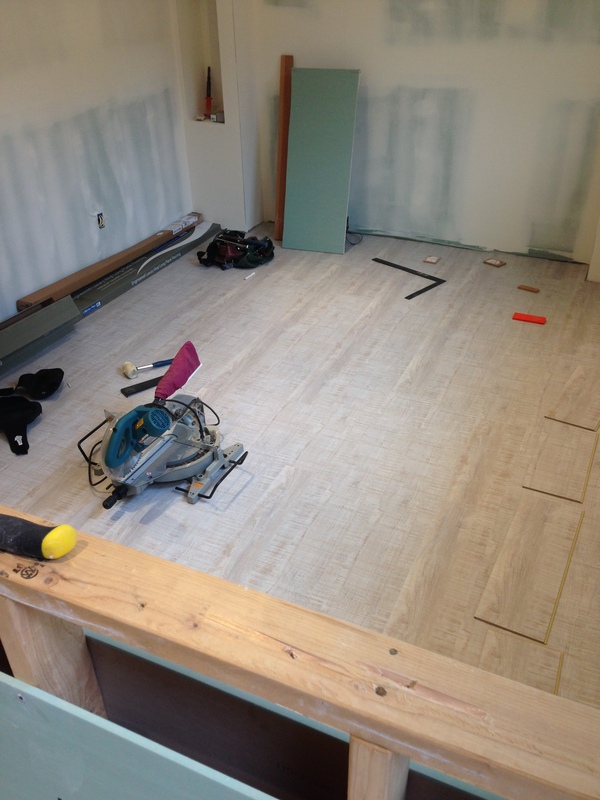 For Mother’s Day Jefe installed my flooring, cooked every meal and did the dishes while I went shopping. I’m so thrilled with what I picked. That goes for guy and floor. 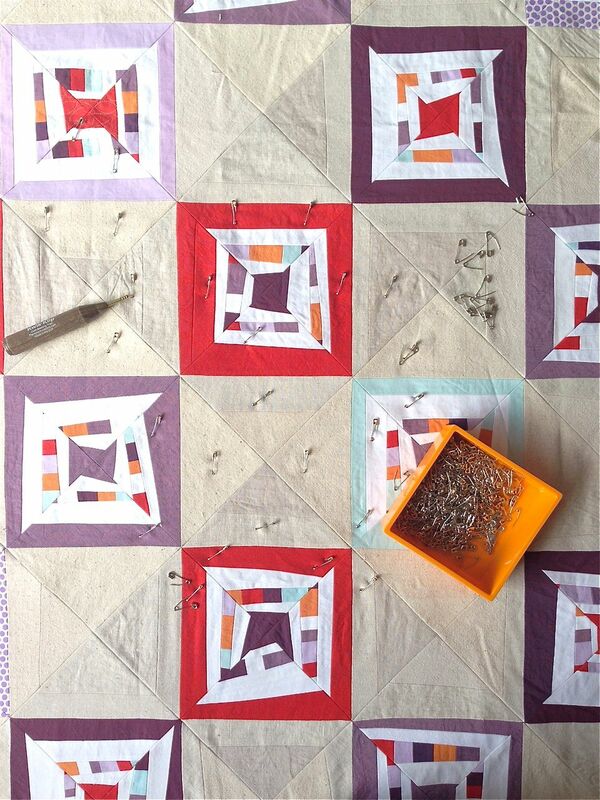 To make a quilt a quilt you eventually have to baste it through your choice method. I’m a pin baster. I also have OBD (Over Basting Disorder). If I’ve already over thought my quilting design then I try to land my pins in areas that won’t interfere too much with it. In my life basting a quilt is a good excuse to clean my floor, have a beer, and soak in a few episodes of whatever TV series I’m currently chain-smoking. I’m having a marathon with Scandal today. Here’s a list of my tools for basting a quilt. A nice container to store them all together in makes for easy transport to my basting spot. Basting Pins– I’ve run into a load of poor quality basting pins in classes. If you’re going to bother pin basting buy good quality, your quilt top will thank you. Heavier thread count material can also make sharp pins even more important. I prefer the smaller curves ones. They are about 1.5″ long. 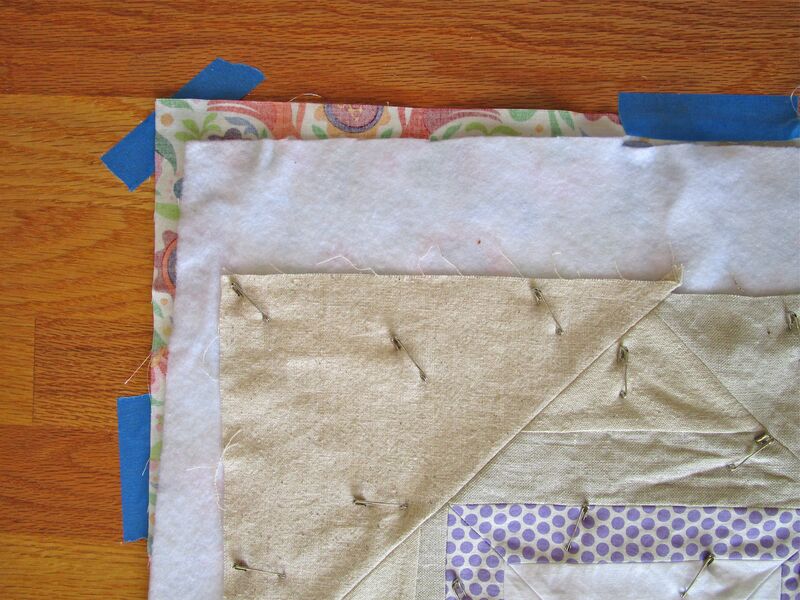 Painter’s Tape– Use this to systematically tape your quilt back right side down to the floor. I work by alternating sides as I tape. Beginning from the midpoint of the sides. Don’t stretch, but it should be flat. Shears– For getting rid of excess batting. I fold the batting back onto itself and cut away at the fold to an inch or so smaller than my quilt back. 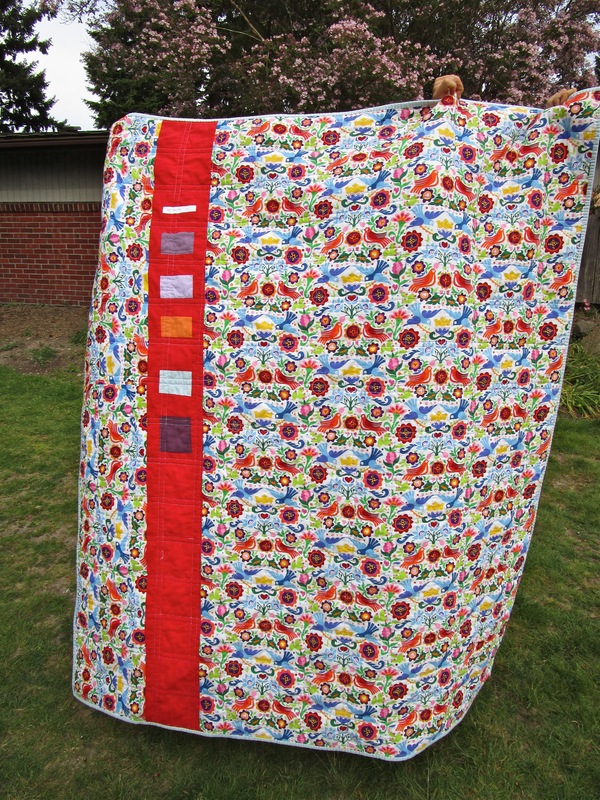 This gives me a visual to run my quilting off the quilt top and secure it into the backing. 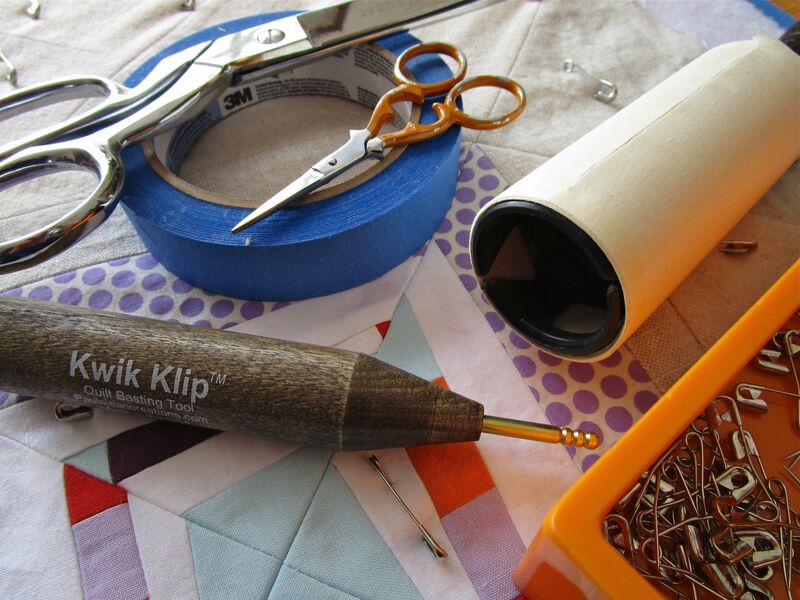 Snips– To rid quilt of stray threads. Lint Roller– Don’t forget about the back. 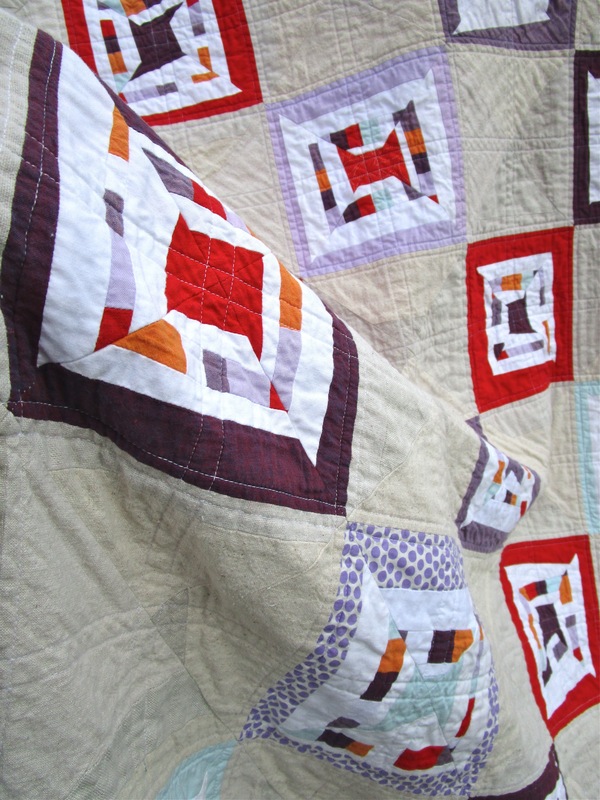 If the quilt has been handled a lot the back will have longer stray threads. It generally isn’t even a problem, but if I have a light color on the front and a dark thread gets quilted behind it it will show through. I find this annoying after putting so much work into perfection. This is by no means a concise tutorial on all aspects of making a quilt sandwich or basting, but I’ll fill in the blanks at some later dates. Any tools you can’t live without? Happy Week Peeps;) I’m off to quilt and fold a mountain of laundry.